The special author critical supplementary journal project of the International Research Council on African Literature and Culture IRCALC has been compiled and professionally edited to provide a solid footing for higher academic reading on contemporary African fiction and poetry. Although it was the aim of this supplement to update a handful of significant responses and approaches to the works of important African writers, what emerged finally reflected the special author concentration of present scholars and researchers of the genre over the years under study. We therefore present these must-read research chapters and reviews as part of our 2007-8 expositions on the aesthetics of contemporary African writing. University departments of literature and Africana studies will find the series useful for research development and appreciation of the modern artistic permutations of Nigerian and African literature. Credit goes to the team of editors, contributors, researchers and facilitators for the commitment to providing and sustaining a regular stream of online and printed discourses on contemporary African literatures and cultures. The Second IRCALC Critical Supplement (A)2 series on African Writing assembles a total of 17 Critical Essays, Chats, and Reviews on the Poetry and Prose Fictions of Nigerian professor of dramatic literature Onuora Ossie Enekwe. IRCALC scholar and editor of the series, GMT Emezue, notes that this is the first collective and comprehensive criticism and theorizing of Enekwe, whose writings have bolstered African aesthetic contributions to world literature and theatre. Onuora Ossie Enekwe is a catalyst for more extensive undertakings in the criticism of Enekwe’s and other serious African writings of our time. The Enekwe supplement emerges in three major parts. The first section, Chats, is a reproduction of earlier published interactions between Enekwe himself and a few commentators on the genre. The second part, Critiques, is the longest of the three series containing objective and scholarly assessments of the merits and perceived drawbacks of Enekwe’s poetry by scholars from Cameroun, Nigeria, Ghana and the United Kingdom. Enekwe is compared with other contemporary African poets as Anyidoho, Ce, Ushie and Ude. The third part of the journal deals with major Reviews of Enekwe’s lesser known and other popular writings which altogether incorporate the rhythm of our exciting but agonizingly self-destructive world. IRCALC scholars and participants in this 2008 Critical Supplement excel in their mandate to appraise the maturation of Enekwe’s craft in the selections beginning from Broken Pots and Marching to Kilimanjaro through Enekwe’s more remarkable short fiction, The Last Battle, including a major reading of that important but neglected novel on the Nigerian civil war, Come Thunder, thereby expanding the latitude for historical, ideological and stylistic criticism of contemporary African writing. 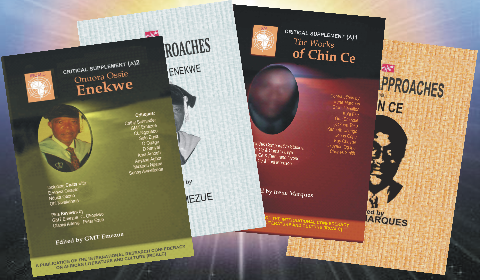 As part of its ongoing collaboration with writers and researchers towards updating critical responses and approaches to the oeuvres of some of the important voices of contemporary African writing, IRCALC editors present select criticisms by literary scholars in United Kingdom, Cameroon, Nigeria, Canada and United States centring on the works of Nigerian poet and novelist, Chin Ce. Divided in three phases of study: an Overview, a section on the Short and Longer Fictions of Chin Ce and a final part dealing with the Poetry of Chin Ce, all works here critiqued include Ce’s well known fictions, Children of Koloko , Gamji College  and poetry, An African Eclipse . Attempts have also been made to give Chin Ce’s other works, The Visitor  (fiction) and Full Moon  (poetry) as much critical attention here as his Millennial  collection of poems. These chapters, taken as a whole, reveal the ideals, craft and vision of Chin Ce’s fictional preoccupation in the past few years. However, they are only a mild testimony to the wider interest and acceptance which the new generation of African voices will continue to generate among literary scholars around the world.